To change things up a bit, this weeks review is actually a fiction short story chapbook. Before I start my review, I would like to say that the chapbook is a very viable means of publishing short stories. They are often published in journals, both online and in print, but those journals have strict word count guidelines. Also, collections of short stories are generally not as marketable as full length novels. The fiction chapbook could be a home for that short story you have that does not seem to fit anywhere else. 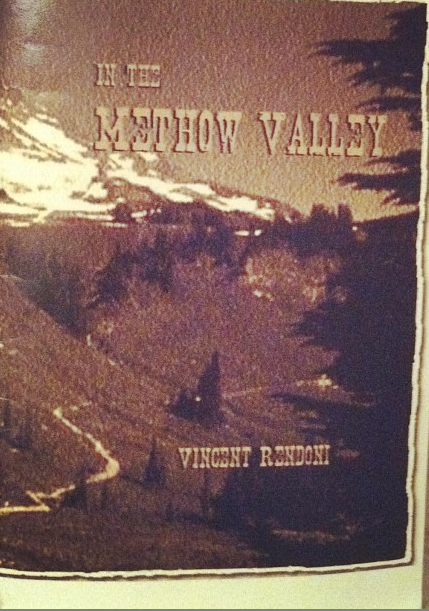 In the Methow Valley is the debut publication of MFA candidate Vincent Rendoni. This story succinctly, and quite brilliantly, captures the relationship between a man and his family, a family and their relationship to the landscape of the Pacific Northwest. The story beautifully renders an incredible saga within this short medium. Told in the first person, In the Methow Valley begins with the narrator’s relationship to his grandfather. The tone of prose is strong and simple, yet surprises the reader with lines like, “she thought it was the funnies thing until I swatted her silly.” The hard drinking characters are as harsh as one would imagine the landscape surrounding them. As the plot progresses, the narrator describes the violence and restlessness that lead to his grandparents running to the Methow Valley from Canada. He also recounts his last camping trip before his grandfather passes away. The story wraps around to present day and the Methow Valley’s trans-formative powers on his own life. In fifteen short pages, Rendoni successfully tells a lifetime of stories. The prose of the chapbook is well written, sharp and controlled. Each of the characters are well rounded. They are violent and harsh, yet the reader also sees their loving, natural side. The story could almost be called nostalgic, but only if one meant the gritty, smudged nostalgia called to mind when one smells woodsmoke in an old favorite, forgotten shirt. I would highly recommend this chapbook for both people looking for a great read and lovers of the Pacific Northwest. Even for those who have never seen this region, the characters of In the Methow Valley, create this landscape for the imagination. Add this book to your chapbook collection.